I have really enjoyed blogging. It's been a fun way for me to journal and has introduced me to some fantastic bloggers. and got so excited that she took the time to say such nice things about me. That picture is kinda miniature, so you can read it for real here. Thanks Emmy for being so wonderful! 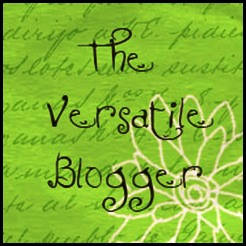 I also came across Melissa's Blog at Living Holland, and she awarded me the Versatile Blogger AWARD. Thanks, Melissa! After receiving this award, you must tell 7 things about yourself. 1. I live in North Carolina (born and raised) with husband, Noel and two sweet baby boys. 2. I have 3 siblings; James, Jessica, and Sarah. I pray every day that my boys will be as close to each other as I am to my siblings. 3. When I like something, I really like it...the color green, Dove chocolate (ok, any chocolate except dark), SJP, Celine Dion, monogramming, Simply Orange Juice, Twilight, Harry Potter....I really could go on for days. 4. My favorite vacation was to the Bahamas with my family. We stayed at Atlantis and had an amazing time. Swimming with the dolphins was incredible, but what I remember most was when my entire family AND my cousin's entire family jumped on to a golf cart, to catch a ride to a destination that was maybe a block a way. The guy said "we could all fit". He turned the key and 1 second later all the tires had popped. We were that family. Brittany, do you remember that? Straight up out of a movie. 6. I have a BFA in Dance Education and also play the piano. (The arts are kind of a big deal to me.) And yes, my boys will play the piano....and I will be the ferocious mother that makes them practice. 7. Noel graduates with his Masters in May (! ), and after that's all taken care of, I'm going back to school for my Masters. Excited for that! Thanks again to Emmy and Melissa! so cute! i wish i could get a blog award, as silly as that may sound! Congrats! Love your fun facts : ) I want to swim with dolphins! And I have a BFA in Theatre Education! Very cool! i LOVE north carolina! i spent two summers are north carolina school of the arts! congrats on the award; it is much deserved! Congrats! The golf cart story is hilarious!!! And Chantal, I'm about to email you because I went there too! Awww congrats Ashley! You deserve it obviously. Umm, yes. Pretty much everyone in the Bahamas should have his driver's license revoked. I remember when my dad didn' want to pay for a minivan taxi and the 5 of us crammed into a car only to find out that the guy was using his emergency brake every time he needed to stop. His real brakes must have gone out. SCARY! Jealous that you are so close with your siblings. I like all of mine but we just aren't really close.